As rock music has grown older, its audience has become more attuned to the occasional renaissance -a once big act, which had fallen on difficult times commercially, rising from its shallow unmarked grave for a further jouste at the fickle public. 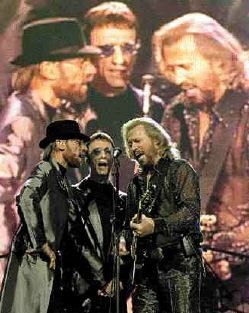 It happens, and more often than might be imagined, but one of the greatest Lazarus acts in the modern history of popular music involved The Bee Gees, the trio of brothers born in the Isle of Man who first came to fame in Australia before returning to Britain to become major stars of the late 1960s. Big brother Barry Gibb and his twin younger siblings, Maurice and Robin, had discovered at an early age the unique vocal harmonic similarities enjoyed by close relatives and, coupled with a desire to entertain inherited from their bandleader father, had performed in local talent contests in the North of England even before the family emigrated to Australia in 1958. Having arrived in their new surroundings, the trio became known as the Bee Gees (short for 'brothers Gibb') and appeared on television, becoming local celebrities during the first half of the 1960s before deciding to return to Britain and try their luck in a major market. 'Massachusetts', which topped the UK chart. They were almost instantly international pop stars as sever more hits in 1968, including another UK No.1, 'I've Gotta Get A Message To You', emphasized. 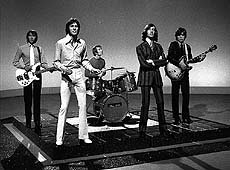 However, after releasing their first US chart topper, 'How Can You Mend Broken Heart', in 1971, things began to go wrong and by 1972, the group, rocked by personnel changes and fraternal disagreements, seemed to have run out of steam, before Stigwood, a steadying influence, restored stability. By 1975, the trio's talents had brought them back to prominence with another big international hit, 'Jive Talkin" which became their second US No.1 and also reached the UK top five. It seemed a short term revival in Britain, although in America -where it was followed by another big hit, 'Nights On Broadway -The Bee Gees appeared to have successfully reinvented themselves as hotshot songwriters and performers of disco music, which was newly established as a major force. In 1976 Robert Stigwood purchased the rights to a yet unnamed movie to be scripted by British writer Nik Cohn after reading an article by Co in a New York magazine entitled 'Tribal Right of the New Saturday Night', about the lives of discotheque afficionados in New York. The movie was eventually to become one of the most successful ever made centred around popular music and was sensationally t revive the career of the Bee Gees. 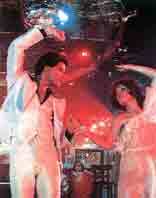 Two key elements in Saturday Night Fever's triumph were the casting of John Travolta in the starring role, and the use of Bee Gees as the main contributors to the film's soundtrack. The group actual performed six self-composed songs used in the movie, one of which was also additionally performed by another group, Tavares, and they also wrote another song, 'If I Can't Have You', which was performed for the film by another artist signed to Stigwood's RSO label, Yvonne Elliman. Both choices proved to be inspired -Travolta became a superstar and The Bee Gees topped the charts with all six of the songs which they had performed in the movie, five of them in succession 'Jive Talkin', 'You Should Be Dancing', 'How Deep Is Your Love' and 'Stayin' Alive'. 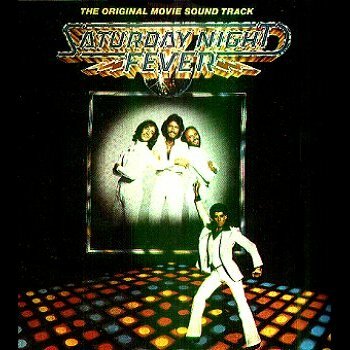 When 'Stayin' Alive' fell off the peak, its place was taken by '(Love Is) Thicker Than Water' by Andy Gibb, (youngest brother of the Bee Gees family), before 'Night Fever' became the sixth chart-topper in the film. That was replaced by Yvonne Elliman's 'If I Can't Have You', which made seven No. 1s on one soundtrack, a record which is hard to believe. Four more singles from the movie entered the chart and the Saturday Night Fever album became the biggest selling sound track disc of all time, topping the US album chart for 24 weeks and its British equivalent for a mere 18, and selling considerably more than one million units. The Bee Gees remained on the crest of the 'SNF' wave until 1980, but then -pop fashion being ultimately unpredictable - once more fell from favour for much of the 1980s, especially in Britain. Just when everyone had more or less forgotten them, out of the blue came another UK chart-topper, 'You Win Again', in 1987. Subsequently, they seem to have disappeared again, but on the strength of their past achievements, it would take a gambler to predict that their absence will be permanent.